Toronto’s Flash Reproductions is passionate about print. In the experienced hands of true print craftsmen, their combination of traditional, offset and digital print technologies positions them as the premiere provider of award-winning print projects. The acquisition of Konica Minolta’s AccurioJet KM-1 UV Inkjet Press opens the world of digital print to the most demanding, creative professional graphic designers and content creators. The American Printer team had the opportunity to interview Flash’s President, Rich Pauptit, and to attend a gathering of Toronto’s graphic design community hosted by Flash to demonstrate the capabilities of its newly acquired KM-1 Press. Read how successful commercial printers and in-plants are using the Konica Minolta AccurioJet KM-1 to increase profit opportunities. Founded by Carl Pauptit in 1969, Toronto-based Flash Reproductions has built a reputation for delivering printing projects that others thought were impossible. Their focus on service is fueled by the desire to never let a customer down. This reputation has made them the go-to shop for Toronto’s most creative graphic designers who bring their most challenging projects, confident that the craftsmen at Flash will continue to deliver some of the most beautiful, award-winning projects in Canada. Rich Pauptit, Carl’s son, and his long-time friend and business partner, David Gallant, continue the heritage of excellence. Friends since high school, they found their way back to the business they both grew up around. Rich shares a bit of their history. “David is a different kind of ambitious than I am. We are very much a Yin and Yang in this company. My ridiculousness would not be possible without him holding the purse strings and keeping us on the straight and narrow,” says Rich. Rich sees his place in the Flash legacy as continuing the hard work and vision of his father, while also being the creative driver for the next evolution of the business. However, that is not how it began. Rich did not grow up thinking he would take over the family business. He had dipped a toe far enough into the business to realize that that was not what he wanted to do. Rich and David continually look to the future as they honor the past, keeping the craft of printing alive while embracing innovations available with the next generation of digital printing. Since its inception, Flash has continually added both printing and finishing equipment resulting in a diverse collection of print processes. The latest advancements in offset printing operate alongside older print technologies including letterpress, screen print, and engraving. This span of capabilities puts an impressive range of capabilities in the hands of passionate, gifted and creative print professionals who truly keep the craft of print alive. Rich describes what most printers know to be true; “Everyone has always wanted the best quality in the shortest time for the cheapest price. We have spent our careers working with our customers to prioritize those three desires, and it’s often a difficult task. “The KM-1’s speed, print quality and cost effectiveness allow us to streamline our workflow to pick up production time that was previously lost to extra prep steps.” - Cobher Press. Read more about the impact the AccurioJet KM-1 has on print production processes. The Flash team is obsessive about print process; they spend lots of time researching and understanding the mechanics of print innovation. Understanding the technology allows them to rely on their own experience and logic rather than promises and sales pitches. In 2012, Rich took notice of the KM-1 and saw it as a printer to watch. 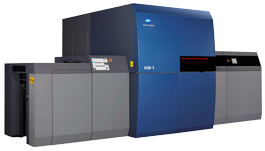 By Drupa 2016, the AccurioJet KM-1 had evolved into a frontrunner for Flash’s next big move. Flash had acquired an MGI prior to Konica Minolta’s partnership and purchase of the company. As MGI integrated Konica Minolta’s print engine in their device, they became an important part of Flash’s support structure. Rich shares, “I will never forget the dedicated support we received for years from Konica Minolta, which technically wasn’t our supplier.” That extra level of support was a major factor in Rich’s decision to partner with Konica Minolta. Partnering with Konica Minolta was not only about the KM-1 Press, but the organization and support they demonstrated throughout the evaluation process. Konica Minolta’s Senior Executive team was involved from the beginning and is committed for the long-term success of our company. We have the confidence Konica Minolta has the global resources and expertise to deliver a world-class experience for the life of the press. 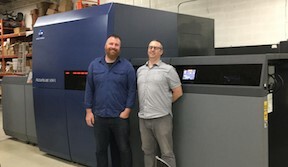 With the AccurioJet KM-1 Press installed and ready to go, Rich and David reached out to their clients in the graphic design community and invited them to see first-hand why they, as Rich said with enthusiasm, “should give a sheet” about it. They hosted an event at a downtown Toronto brewpub and were joined by over 70 artists who got to see, touch and feel what Flash Reproductions could do with their new AccurioJet KM-1 digital printer. As samples of a wide array of printed output produced on a range of substrates ̶ from traditional paper to substrates made from potato starch ̶ circled the room, Rich told the audience that the AccurioJet KM-1 was truly the answer to longstanding questions around what was possible with print. As the printed samples provided the proof of print quality, he brought the business value to the conversation. The KM-1 enabled Flash to do short-run, offset quality work in the digital world, and at a cost that made it amazingly attractive. Members of Toronto’s graphic design community join Flash Reproductions for a hands-on look at the brilliant output from the Konica Minolta AccurioJet KM-1 Inkjet Press. Even though he has ink in his veins, Rich has creativity in his heart. He is an artist too – his passion project is music, which he creates and records for the satisfaction it brings. He translates the technical world of print into language that resonates with the creatives who are always looking for methods to bring their vision to the physical world through print. “To put it simply, the KM-1 appears that it will allow us to offer what everyone wants: the best quality in the shortest time for the lowest price. To be frank, it seems too good to be true, but our investigation into the machine has led all of the experts at Flash to uniformly believe that this may well be the machine we have been waiting for!" Flash Reproductions is embracing the opportunities that the Konica Minolta AccurioJet KM-1 brings to its business. The KM-1 Success Series eBook contains experiences from other innovative commercial printers and major in-plants, like Old Trail Printing, Panoramic Press, and Shaw Industries, as well as an inside view from Konica Minolta’s Bill Troxil how he and his team, backed by the world class Konica Minolta engineering experts, deliver on the promise of AccurioJet Inkjet Press technology. Download the KM-1 Business Success Article eBook and read how successful commercial printers and in-plants are using the Konica Minolta AccurioJet KM-1 to increase profit opportunities.